YOU are the key ingredient to every recipe. Make it fun. Lick the beaters! The word “biscotti” literally means twice baked in Italian. The fact that we are baking something twice might make this recipe sound complicated, but it’s really not! This biscotti is sooo- buttery and very light and sweet. You will enjoy it down to the last crumb. BISCOTTI. This recipe is more like biscotti meets shortbread cookie meets butter pecan–and then dip it into a steamy hot cup of joe. It is SO. STINKIN’. GOOD. Making biscotti is really not any more advanced than making cookies. You really don’t have to do anything fancy other than separating it into two log shapes. And then once that is baked, you slice it as thin or thick as you would like, and put the slices back into the oven. Flip those bad boys over and put the pan into the oven for its final hurrah! I’m telling ya, invite some friends over, and watch those caffeinated comrades of yours devour every last bite of this delectable biscotti! Ciao! Preheat oven to 350 degrees (F). Line a baking sheet with parchment paper or grease well. Set aside. In a large bowl, beat butter and sugar together at medium speed until creamy (just a minute or so). Add extracts and beat in eggs one at a time, mixing into butter/sugar. In a small bowl, mix together flour and baking powder with a fork. Add flour mixture to creamed butter/sugar/eggs and mix until well combined. Place the logs side by side on prepared baking sheet and place in oven. Bake for 20-25 minutes until golden. Remove from oven and slice logs into slices- should make 18-20 slices per log. Turn slices flat to one side on the cookie sheet and bake in oven for additional 15 minutes or so. Remove from oven, flip slices over, and bake for the final 15 minutes until crispy and golden. ENJOY with a hot cup of coffee! When I was in college, my roommate crushed up some cookies, added cream cheese and then covered little scoops in white almond bark. I have been tainted ever since. End of story. Mmhm...check, and…check. 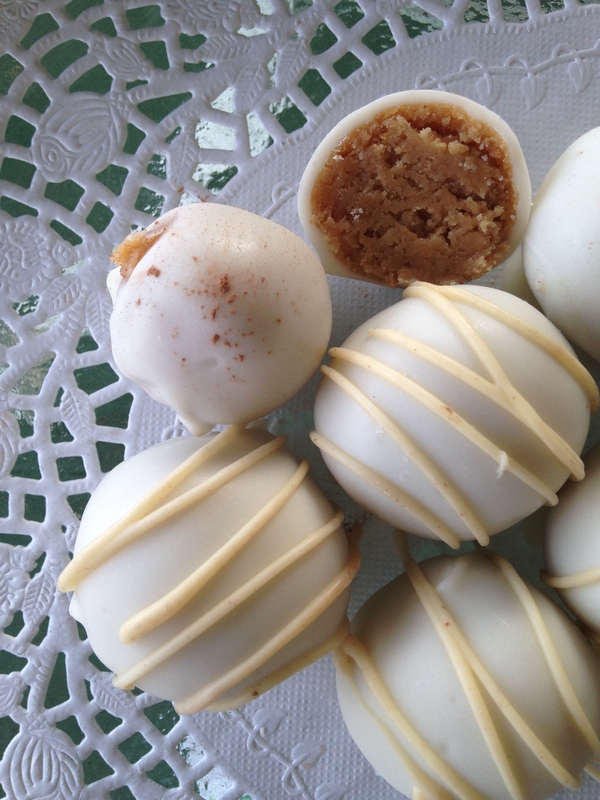 Truffles cause a need in my life. 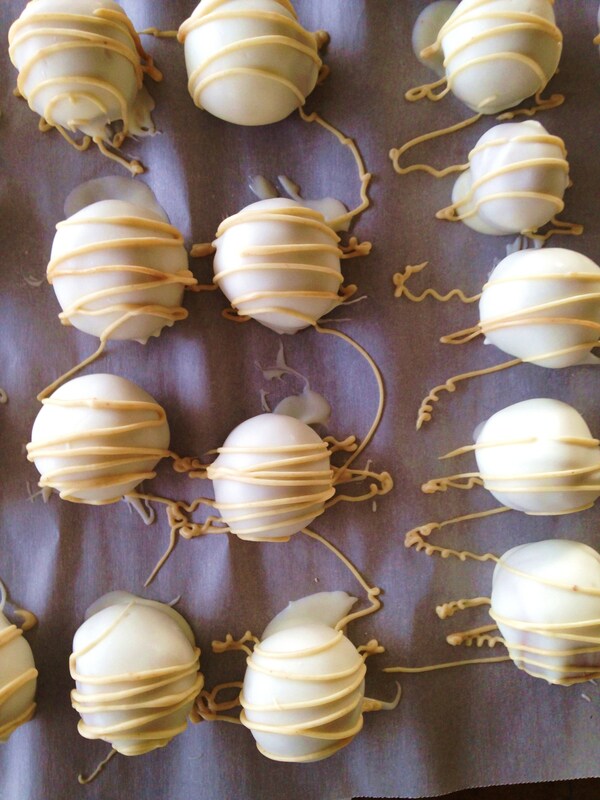 My roommate made her truffles with Oreo cookies back in the day. I took it a step further and tried it out with Nutter Butter cookies. My oh my, the results were astounding. 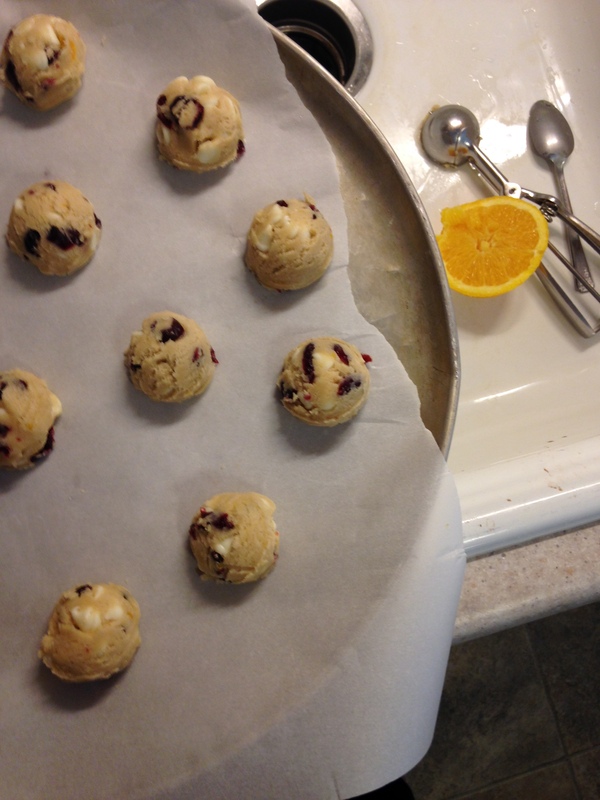 Roll mixture into 1-inch balls (I wouldn’t go any larger) and place balls onto wax paper-lined cookie sheet. Melt almond bark or candy coating per package instructions in the microwave. Transfer extra almond bark/candy coating and peanut butter to small Ziploc bag and knead until combined. 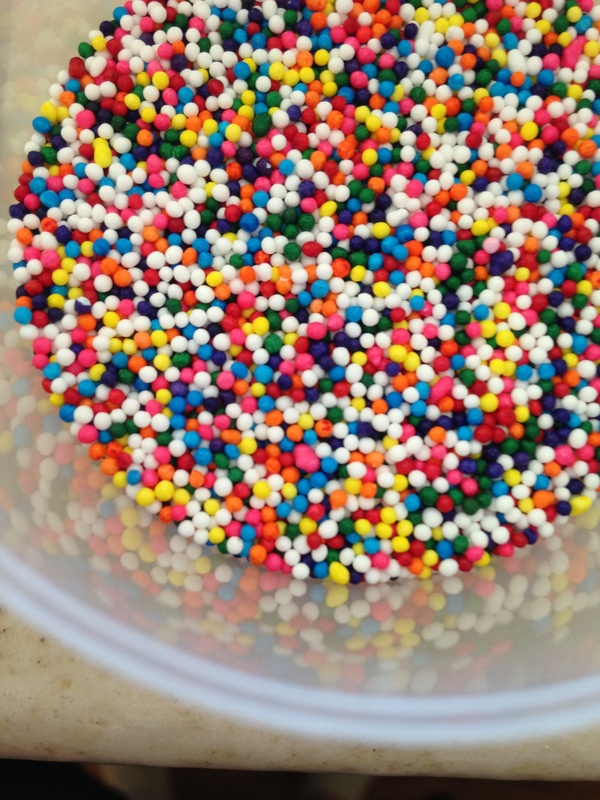 Cut a VERY small opening in one corner of the bag, creating your own icing bag. 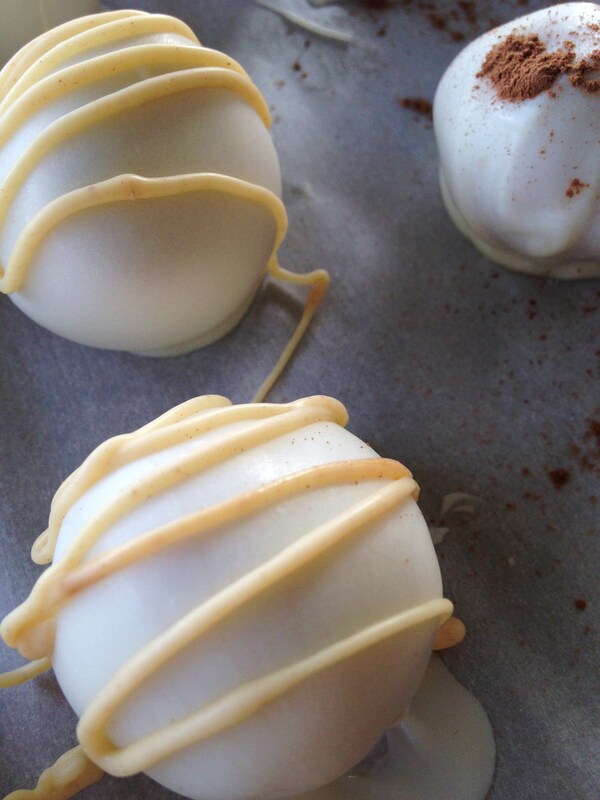 **Notes: Truffles should be stored in the refrigerator or freezer and are best served chilled. They tend to crack open if they get too warm. Have fun! Can you believe that it’s almost Christmas already? One of my favorite family traditions is that each year at Christmas, my mom has us help her bake a bunch of cookies and then we put together cookie trays and share them with our neighbors and friends. This year, I had to make one of my favorites. It isn’t necessarily a Christmas cookie, but who cares!? I think any cookie can be a Christmas cookie. If I make it in December, I am calling it a Christmas cookie. 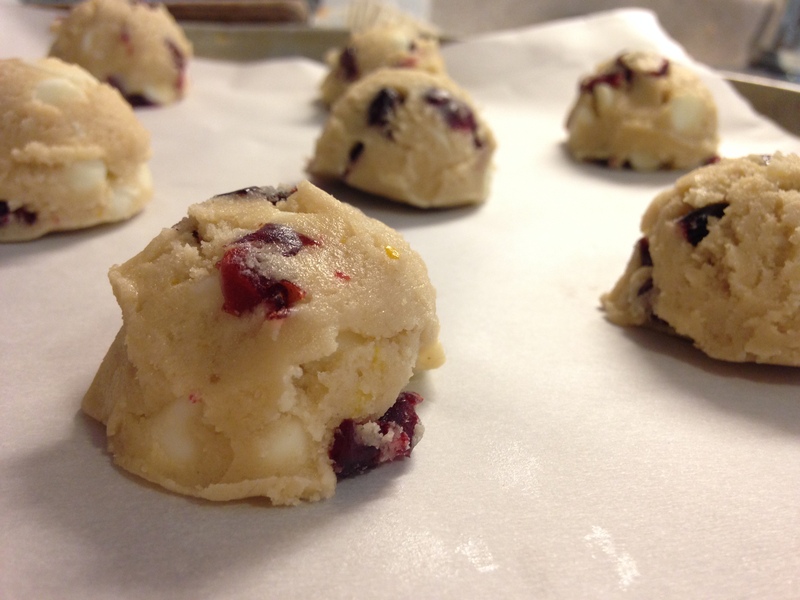 So Cranberry White Chocolate Chip Orange Cookies. What a delectable combination, huh? My grandma says that these could be eaten for breakfast because they are so lightly sweet and have such a fresh taste. 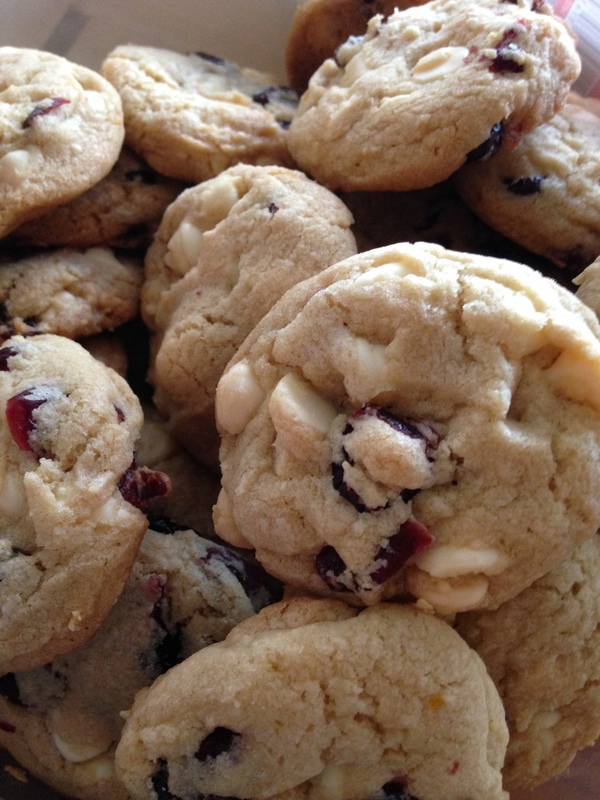 The dried cranberries are so yummy when mixed with white chocolate, and that hint of orange zest…oh yeah…it is the game changer. This scoop looks just as good as a fully-loaded Carbine Action 200-shot Range Model air rifle with a compass in the stock and “this thing which tells time”. That’s from A Christmas Story…Hello, Ralphie? Did you catch that? Again, bear with me….it’s almost CHRISTMAS! The dough looks so stinkin’ inviting and friendly. Yes, I just called cookie dough friendly. It’s always so nice to me….ha…okay. Anyway, these cookies are scrum-diddly-umptious and you will want to make them again and again. I promise! With an electric mixer, cream butter and sugars into a large bowl. Beat in egg and orange zest. Stir flour, baking soda, and salt together in a separate bowl. Add flour mixture to creamed butter and sugars. 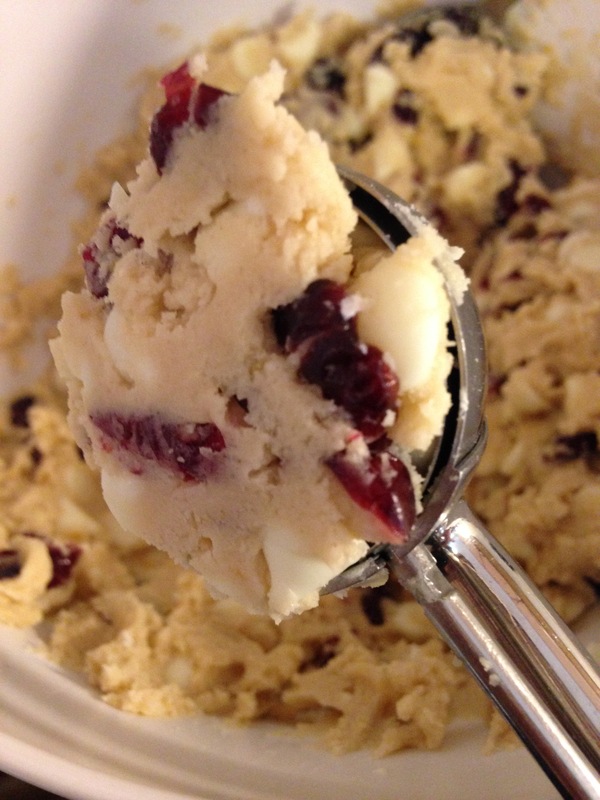 Stir in cranberries and white chips with a spoon. Bake for 10-12 minutes until cookies are slightly golden. ENJOY and share with your neighbors! Thursday night and feeling CRAZY!!!!! But I did just get home from a cookie decorating party! Wahoo! And my teeth are coated in sugar. I was struggling. Sometimes you just have to be in the mood to decorate cookies. Sometimes you just want to bake cookies. Then sometimes, you just want to eat the cookies. Sometimes, you think it would be so fun to decorate cookies and then all of a sudden you realize it is just not that fun tonight, so you start eating the peppermint M&Ms one by one and……the rest is history. Judging from my candy-coated canines, I’ll bet that I put more sugar in my mouth than on top of cookies tonight. I love a delicious cutout cookie. Notice how I said a delicious one. My ideal “delicious” sugar cutout cookie has to be thick. It has to be soft (but firm) and chewy, just barely on the verge of being golden, and has to have a hint of almond extract. Deeee-licious! 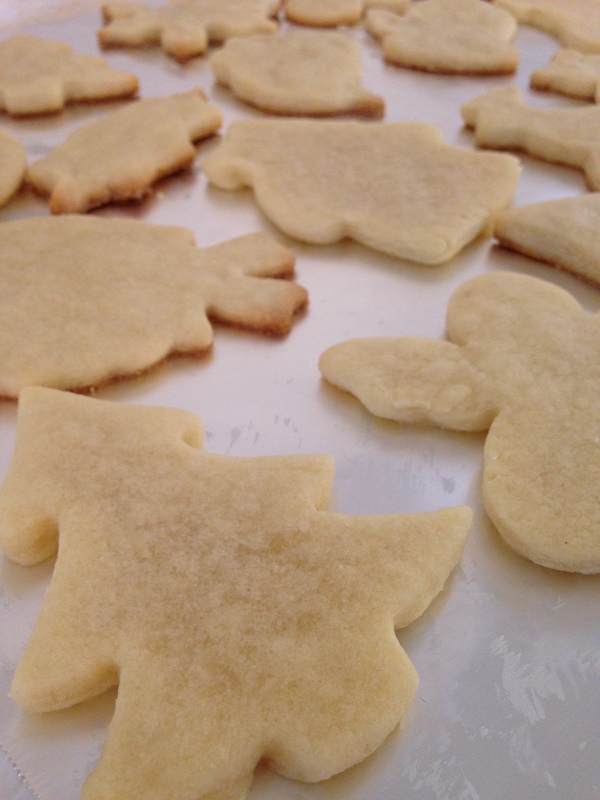 This is my absolute favorite recipe for cutout cookie perfection. It is my go-to recipe. ZERO chilling of the dough, which is huge for me. I hope you love it like I do. Beat in egg first, then add in both extracts. Grab a small bowl and combine flour, baking powder, and salt with a fork. Use cookie cutters or a glass to cut your cookies into desired shapes and transfer to an ungreased cookie sheet using a metal spatula. Bake for 8-12 minutes, until the edges of the cookies just barely begin to brown. 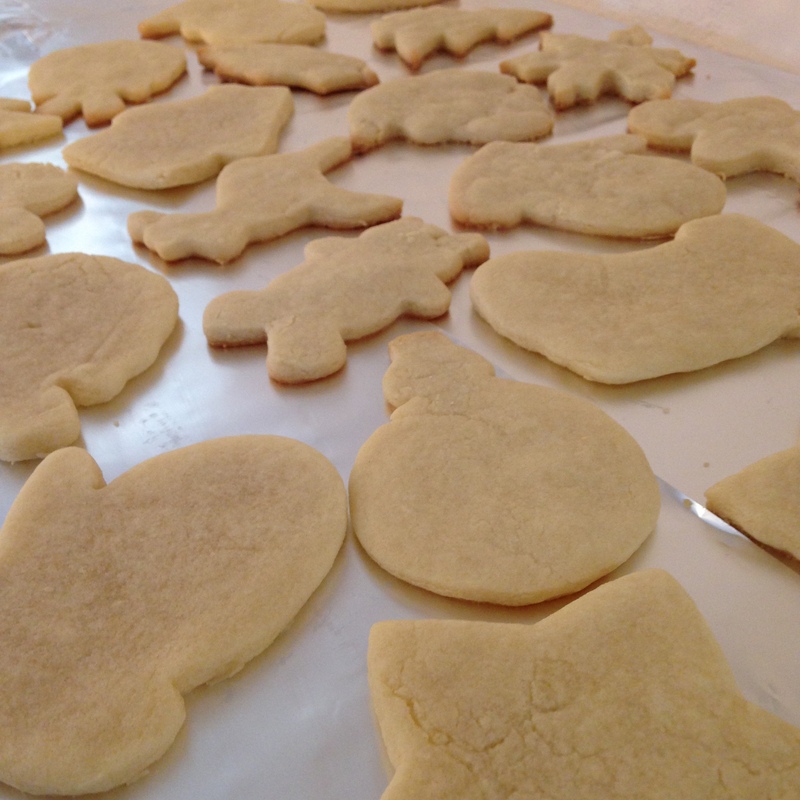 Let cookies cool completely before frosting or decorating and share with your family and friends! YUM! **Store in an airtight container to keep cookies from drying out! Cookies also freeze well! Not on WordPress? No problem! Sign up by email to stay updated on Karlie's latest blog posts! Like Karlie and Oats on Facebook!